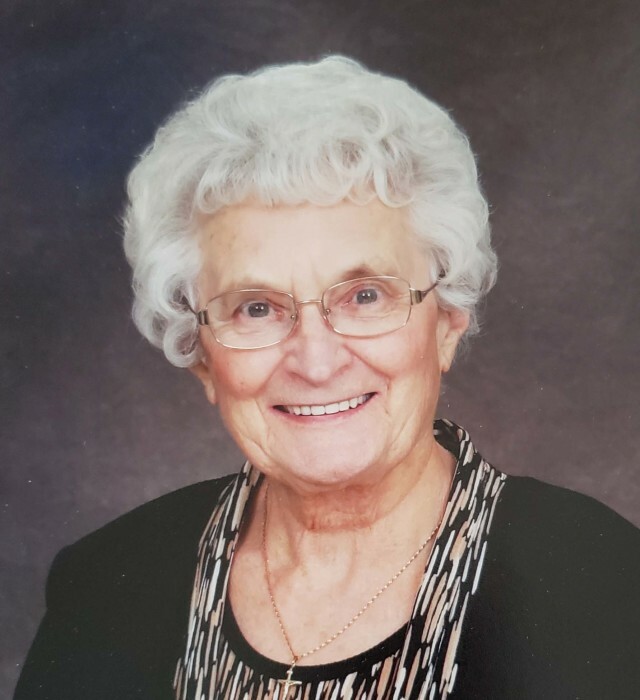 It is with great sadness that the family announce the peaceful passing of Mrs. Helen Saretsky, 86 years of Wainwright, AB and formerly of Humboldt, on Wednesday, November 21, 2018 at Royal Alexandra Hospital in Edmonton after a brief illness. Helen was born on June 14, 1932 in the Plunkett District. She obtained her elementary education at Badger School, then middle years at Plunkett and high school at Sacred Heart Academy in Yorkton. Following high school, she entered the St. Elizabeth’s School of Nursing and graduated as an RN in 1955. Growing up, ball was the sport of choice as a child and with three brothers, Helen and Alice got a good cardio workout chasing after all the fly balls that the boys would hit. After graduating nursing, she worked at a few hospitals in the province including Rosetown, Rose Valley, St. Paul’s in Saskatoon, North Battleford, and Melfort. On June 19, 1965 she married Frank Saretsky at St. Augustine Parish and this union was blessed with two sons. Frank’s job took them to communities in the province where Helen always found a hospital to work. In 1974 they returned to Humboldt and she worked at St. Elizabeth’s Hospital for 16 years and 7 more years at St. Elizabeth’s Convent. Helen knew she wanted to be a nurse right from a young girl. Nursing was her passion. She loved every aspect of nursing and being able to help people through many difficult times. If you knew Helen, you will remember her attention to detail in all areas; from her crisp clean polished shoes to her crisp uniform and hat that she wore proudly. This attention to detail became a positive trait in her job. She was an amazing nurse and she probably was involved in close to 40% of the births in the Humboldt area in the late 1970’s and 1980’s. Many people who had Helen as their nurse or worked with her, can attest to her excellence as a teacher and caregiver. She was very active as a volunteer in many organizations such as St. Augustine CWL and St. Elizabeth’s Hospital Auxiliary to name a few. She had high standards and if it was work or volunteering, when a task was presented to her, she would complete it with excellence. Helen was very active in her son’s sports. She was very supportive and always cheering them on in swim meets, hockey games, and what ever else they were doing, and was always very proud of them. Her face lit up when she shared stories of them and their accomplishments, and later stories of her grandchildren. Helen was an amazing cook and provided tasty dishes for her family and friends. Some of everyone’s favourites were: beef stroganoff, peach kuchen, poor man’s cake, bachelor’s cake, her cinnamon buns and everyone’s all time favourite was her moist carrot cake that could easily be eaten up before it had time to cool. Ukrainian traditions were always part of Helen’s life. Her family enjoyed, and still continues to celebrate, the traditional 12 dishes for Ukrainian Christmas Eve. She always had her own little stash of candy, liquorice along with her all time favourite Cheezies and Fresca. In her spare time Helen designed many beautiful bedspreads, quilts and baby items. She enjoyed knitting, embroidery, and crocheting, including during swim meets and hockey games. She always had a cat around the house for companionship and loved to spend time in her garden, and sharing excess raspberries and other vegetables that she couldn’t use. Helen’s loving, caring, giving personality will be missed and many people will remember her presence in their lives. In 2014, due to failing health, Helen moved to Points West Living in Wainwright to be closer to family. She enjoyed her time there, and definitely left a footprint in the hearts of the staff. Helen will be sadly missed and lovingly remembered by her two sons and five grandchildren: Michael (Kelly) Saretsky of Doha, Qatar and family Amy of Lowell, Massachusetts, USA and Daniel of Victoria, BC; Vincent (Tracy) Saretsky and family Brant, Parker and Brooklyn all of Wainwright, AB; sister Alice Germann; brother Ted (Eva) Senko; and brother-in-law Leo Saretsky all of Humboldt; and numerous nieces and nephews. Helen was predeceased by her parents John and Mary (nee Byj) Senko; husband Frank Saretsky (2000); two brothers Alec (Olga) Senko and Steve (Elsie) Senko; brother-in-law Walter Germann and members of the Saretsky and Senko families. A Prayer Service was held on Monday, November 26, 2018 at 7:00 p.m. presided by Nestor Trach. A Funeral Mass was held on Tuesday, November 27, 2018 at 1:00 p.m. Celebrated by, Fr. Peter Olisa and Deacon Michael Hall. Both services were held at St. Augustine R.C. Church Hwy #5 Humboldt. Interment followed at St. Augustine R.C. Cemetery. Memorial donations can be directed to Elizabeth’s Inc, St. Augustine Parish, Points West Living (Wainwright, AB), or The Alzheimer’s Society.